Exposure to certain chemicals and pollutants before and during your pregnancy may have an effect on you and your unborn baby. You can take simple steps to reduce your exposure to harmful substances often found in and around the home. Plastic storage containers or toys that are not BPA-free or PVC-free. Lead from pipes and renovation projects. Cleaning products with ammonia, bleach, and turpentine. Glass food-storage containers or plastic products labelled as BPA-free. Toys labelled as phthalate-free or PVC-free. Latex paint and low-VOC paint or VOC-free paint. Baking soda or vinegar mixed with water as a cleaning agent. Airing out new plastic items before their use. Dusting or mopping your home frequently. Using lead-free products for hobbies such as painting, stained glass, and glazing pottery. Removing shoes at the door. Using a dry cleaner that does not use solvents. Ventilating your home when cleaning or painting. Reducing activity outdoors during Air Quality Index advisories. Some personal care products may not be safe during pregnancy. Contact Motherisk (see below) or speak to your health care provider if you have questions regarding personal care products or herbal products. Just because something is labelled as natural does not mean it is safe in pregnancy. Skin products that contain retinol. Cosmetics that contain toxic ingredients. Natural health products or herbal substances (pills, teas). Use seatbelts and airbags properly when travelling by car during pregnancy. It is important to use your seatbelt while pregnant. You may need to adjust your seatbelt as your body changes. Use a seatbelt with a lap and shoulder belt. Make sure there is no slack at your pelvis and shoulder. If the car has airbags keep at least 25 cm (9.75 inches) between you and the steering wheel or dashboard. Make safe travel plans if you need to travel during your pregnancy. Discuss any travel plans with your health care provider. When and where it is safest to travel during your pregnancy. Method of travel. When travelling requires sitting for a long time, it is important to get up and walk around every one to two hours. Health facilities available to you at your destination. Vaccines you may need to protect yourself and your unborn baby. Extra insurance in case you need to see a health care provider. Carry your prenatal records and your health care provider’s contact information with you when travelling away from home in case of emergency. Most women can continue to work safely throughout their pregnancy. If possible, adjust your workstation to suit your work and your changing body. Avoid heavy lifting, pushing, pulling or carrying. Take breaks if you have to sit or stand for long periods. If possible, reduce your stress levels. Avoid extended exposure to loud noise and very hot temperatures. Use safety precautions when working with X-rays. Use caution regarding exposures to infections. Make sure your vaccinations are up to date and practice good hygiene. Follow safety guidelines when working with chemicals and contaminants. Discuss your work environment with your health care provider. Speak with your employer about any concerns that are raised. Discuss if modifications are needed to ensure your health and the health of your unborn baby. You may also check workplace safety guidelines and speak with your company’s occupational health and safety office if they have one. Caring for pets when you are pregnant may pose a health risk to you or your unborn baby. The following is a list of precautions to take when caring for your pet. Avoid handling soiled cat litter to reduce the risk of infection with toxoplasmosis. If you cannot avoid it, wear gloves and wash your hands well afterwards. This is important. Get medical attention if you are bitten by an animal, including pets such as dogs, cats, or rodents. Avoid handling exotic animals if possible. If unable to avoid, find out how you can handle your exotic pet safely during your pregnancy. Learn more about safety during pregnancy. You can find out more about safety during pregnancy from the following resources. More suggestions can be found in the Resources and Links section. Most babies are born healthy. The majority of women strive to have a healthy pregnancy; however, some may unknowingly have harmful exposures that could have been avoided or minimized. Certain prenatal exposures may have lifelong impacts including birth defects; learning, developmental, or behavioural problems; and cancers. 1 Appendix A is a depiction of when the fetus is most vulnerable during development. Risks to the fetus exist in greater amounts during the first trimester. It is estimated that three to five percent of children in Canada are born with a major birth defect. 1 That rate rises to seven percent when major defects discovered after the neonatal period (e.g., at one year of age) are included.1Exposure to medications, drugs, or a chemical in pregnancy is estimated to cause less than one percent of birth defects.2Table 1 lists causes of birth defects and their relative frequency. Martin, B., & Morin, C. (2007). Connaissances de base sur l’utilisation de médicaments au cours de la grossesse. In E. Ferreira, Grossesse et allaitement: Guide thérapeutique (pp. 35-52). Montréal, QC: Éditions du CHU Sainte-Justine. Pesticides are commonly used in and around homes to rid the environment of pests such as insects. They contain chemicals that may alter fetal growth and impair neurological development. Pesticides can also be found on fruits and vegetables and in insect repellents. Clearing the home of food waste. A pregnant woman’s skin, especially the skin of her face, is more sensitive to the effects of sun exposure. Sunlight may increase hyperpigmentation (or pregnancy mask) for some pregnant women. Avoid self-tanning lotions if they are irritating. Current literature cannot confirm or exclude the risk for hepatitis B virus (HBV) and hepatitis C virus (HCV) transmission in nail salons and barbershops. Existing sanitary requirements are adequate in the majority of the United States, but compliance is needed to prevent HBV/HCV transmission in these businesses.24 According to the Public Health Agency of Canada, there have been no reported cases. Discuss the use of these products with their health care provider. Regular soap, used properly, is an efficient cleansing agent if a woman chooses to avoid antibacterial soaps. Read the labels of topical products. Health Canada provides a list of natural and non-prescription health products that can be referred to. It is prudent for pregnant women to speak with their health care providers to discuss the use of natural health products during pregnancy. Most insect repellents contain diethyltoluamide (DEET), a chemical compound whose concentration varies from product to product. Although DEET is recognized as being of low toxicity,27,28,30 limited information is currently available as to its use during pregnancy.31,32,33 Nevertheless, the benefits of applying DEET during pregnancy appear to outweigh the risks of contracting a disease such as West Nile virus. Reduce exposure to insect and tick bites by wearing long clothing and applying the insect repellent to clothing instead of directly on the skin. A certain amount of risk is involved in transportation and travel, even when not pregnant. Although many forms of travel are considered safe during pregnancy, caution should be exercised when involved in boating, snowmobile, or ATV use. Women should be encouraged to speak with their health practitioner about engaging in these activities while pregnant. Studies have shown that many pregnant women are uninformed about proper seatbelt use.36,37 A car accident during pregnancy may result in serious injury to the pregnant woman and her unborn baby. Many studies show that pregnant women who are given information about proper seatbelt use are more likely to wear their seatbelt and to position it correctly. Position the lap belt at the pelvis under the belly. Maintain at least 25 cm between their sternum and the centre of the steering wheel (or the dashboard if the woman is not driving). Move the seat back to maximize the distance between herself and the steering wheel as her abdomen grows. The Government of Canada states that air travel is considered safest from the 18th to the 24th week of pregnancy.42 Airlines usually allow pregnant women to travel up to one month before their due date.42 Certain airlines may impose restrictions. It is advisable to seek information from the airline prior to making travel arrangements. Consult their health care provider prior to making travel plans. Stand up and move around about once every one to two hours. Stretch their legs while seated. Select an aisle seat if possible. Consult their health care provider prior to making travel plans to an international destination. Visit a travel health clinic if recommended by their health care provider. Obtain travel/health insurance appropriate for their travel plans and pregnancy stage. Carry a letter stating the due date for immigration or airline purposes. Most jobs do not pose concerns during pregnancy. However, a few small changes at work can make a big difference to a woman’s comfort and the health of the unborn child. Pregnant women are protected under the Canadian Human Rights Act against discrimination and undue hardship (e.g. health and safety risks).44 It is the responsibility of the employer to ensure that pregnant women are accommodated in their area of work to ensure the safety and well-being of the pregnant woman and her unborn child. Some jobs may require a woman to stop working or change to a different type of work during her pregnancy. This can be prompted by risks associated with her work or work environment, problems with a previous pregnancy, or problems during the current pregnancy. Reduce her workload and/or shift work if necessary/possible. Seek assistance from others to relieve stress in the workplace or home. Speak with her health care provider and employer regarding her work stress. A variety of physical factors can affect work safety during pregnancy. Sitting for long periods of time may cause legs and feet to swell and cause muscle strain and tension. Use safety precautions if working with X-rays. Avoid extended periods of loud noise when possible. Avoid long exposure to very hot temperatures. Seek comfort at work such as using a cushion and/or a footstool, rotating sitting and standing tasks, moving around in the workspace, and wearing loose clothing. Ensure they are immunized prior to pregnancy if possible. Avoid contact with infectious people. Use necessary protection like masks or gloves as required. More information about immunization recommendations for pregnant and breastfeeding women is available on the Public Health Agency of Canada website. Although the evidence is conflicting, occupational exposure to solvents during pregnancy has been associated with an increased risk of major malformations.54,55 Other chemicals that a pregnant woman should be aware of in her workplace are the presence of lead, mercury, or pesticides, etc. Discuss safer alternatives (if available) with her employer. If a woman has concerns regarding exposures to chemicals at work, she should speak to her occupational health representative or equivalent regarding reducing exposure. If there is no occupational health individual, she should speak to her health care provider and/or employer. To reduce the risk of infection cat litter boxes should be cleaned daily. Seek medical attention if bitten by an animal. Those with concerns about the effect of their work environment on their pregnancy. Those complaining of any medical concerns or conditions. Her health care provider (obstetrician, family physician, Nurse Practitioner, or midwife). Her local public health unit 1-866-532-3161. An employer or health and safety representative at her place of work. Occupational Health Clinics for Ontario Workers 1-877-817-0336. Ontario Human Rights Commission 1-800-387-9080. 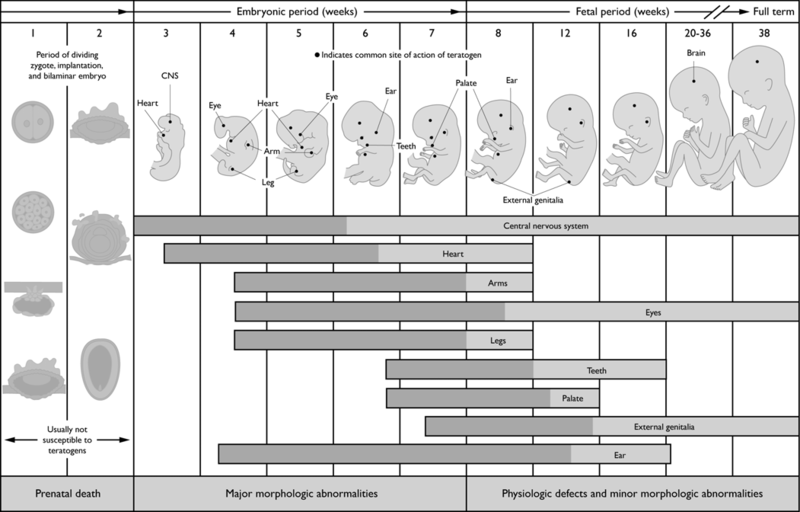 This figure shows critical periods of fetal vulnerability. The dark grey bars denote highly sensitive periods; light grey bars indicate stages that are less sensitive to teratogens. The concept of vulnerability is complex, and this figure does not provide sufficient information to attribute causes of a particular health outcome such as stillbirth or cancer. Reprinted from The Developing Human: Clinically Oriented Embryology, Moore and Persaud, page 98, Copyright (1973), with permission from Elsevier. Wear gloves and thoroughly clean hands and nails when handling material potentially contaminated by cat feces (sand, soil, gardening). Reduce the exposure risk of pet cats by (1) keeping all cats indoors (2) giving domestic cats only cooked, preserved, or dry food. Change litter and get rid of cat feces (wearing gloves) on a regular basis (every 24 hours). Disinfect emptied cat litter tray with near-boiling water for 5 minutes before refilling. Eat only well-cooked meat (> 67°C/153°F). Clean surfaces and utensils that have been in contact with raw meat. Do not consume raw eggs or raw milk. Wash uncooked fruits and vegetables before consumption. Prevent cross-contamination: thoroughly clean hands and utensils after touching raw meat or vegetables. Do not drink water potentially contaminated with oocysts. the process of curing, smoking, or drying meat does not necessary result in a product free of parasite cysts. refrigeration does not destroy the parasite (still viable after 68 days at +4°C).